Asian shares are still struggling on Wednesday as it begins to dawn on investors that the Chinese economy really is slowing. The implication for that is more deflation in commodities as they have accounted for nearly 50% of the purchases of commodities these past few years. As with respect to world total GDP, China has also accounted for nearly 50% of all growth, making up for the dismal growth in Europe. Investors are starting to fear that even fresh rate cuts in China will not be enough to stabilize its slowing economy and thus, stem the tide of the collapse in Chinese share prices. 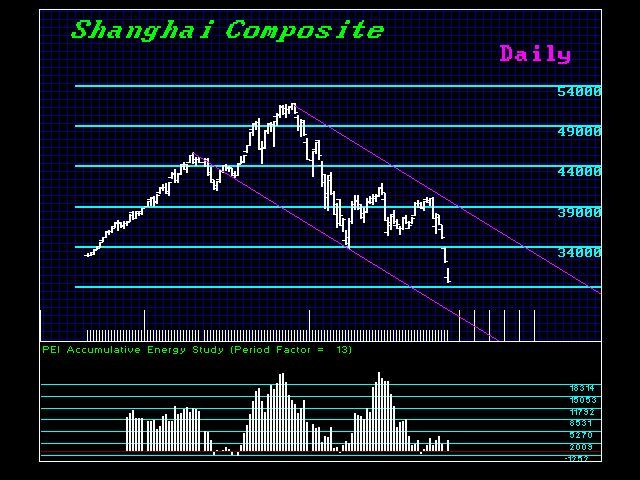 As we stated, the charts are different in the Shanghai index, warning that new lows are clearly on the horizon. Much as the decline in Japan unfolds, every attempt to rally saw China’s key share indexes smacked back down by waves of selling. This illustrates the overall investors’ view that support that is far more aggressive is needed from the government and the central bank to hold the market. If China is wise, they will not follow the route of Japan. The sooner the bloodletting is allowed to unfold, the sooner the trend will conclude. In the USA, we still see Monday’s low as critical, as well as this week. A breach of this week’s low warns of a maximum decline of about 5000 points from the May high on the Dow, so that would bring us into the 12000 zone. The critical number that we will have to watch for on the closing of the month on the 31st will be 15550. If we close below that level, this will warn that indeed we may be looking at an October low. Additionally, critical support for the Dow (big money) lies at 15961. If we close beneath that level, this too will warn that support below is starting to yield and a steeper decline is likely down to the 13900 area. We see about a 2000 point gap, but we do NOT expect that to occur in a couple of days. It would most likely become the target for an extended decline into October, with the extreme target in the mid 12000 zone.